A news feature on the martial law period over Star FM radio noted, among other anomalies, that the major supporters of martial rule included now Senator Juan Ponce-Enrile, who was the Marcos regime’s secretary of defense and chief implementor of martial law, and Fidel V. Ramos, who as Chief of the defunct Philippine Constabulary was in command of the detention centers of the regime all over the country, but who nevertheless became President of the Philippines from 1992 to 1998. In print, the Philippine Daily Inquirer, in commemoration and remembrance of “one of the darkest chapters in Philippine history,” ran a series of articles on the experiences of the men and women who were arrested, detained and tortured during the martial law period, who included, among others, screen playwright Ricky Lee and National Artist for Literature Bienvenido Lumbera. The same trivialization and ignorance has been evident for years not only among the young but even among older Filipinos, judging from the evidence not only in their issuances in the old media but even in the new. 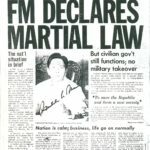 In such social media sites as Facebook and Twitter, the same moral agnosticism and intellectual vacuity approach epidemic proportions every September, when the declaration of martial law in 1972 becomes the subject of posts by, among other groups and individuals, former political prisoners. Ignored, forgotten or never quite learned, much less understood, is how the martial law period not only savaged the Bill of Rights, the economy, and those institutions of liberal democracy such as the press and representative democracy that, though flawed and limited, nevertheless allowed some measure of dissent and free expression, but also established a pattern of abuse and repression from which the country still has to recover, and decimated the ranks of an entire generation of the country’s best and brightest sons and daughters. The country’s failure to put in place a means of presenting with some guarantee of accuracy what actually happened during the period through an authentic truth commission in the manner of such other countries that emerged from dictatorship and repression as Chile, Argentina and South Africa, has been blamed for the inability of many Filipinos to comprehend the dictatorship’s human cost and the extent to which it set back the country’s democratization and social, cultural and political development. The default implies acceptance of the conventional explanation for the country’s descent into dictatorship – that it was merely the consequence of the ambition and corruption of one man, his wife, and his cronies. It’s a view that suggests that without a Ferdinand Marcos the dictatorship would not have happened. Ignored are the authoritarian roots of the political system itself, whose trappings of democracy concealed the fundamental reality that the handful of families that have been using their monopoly over political power to defend and enhance their economic interests for decades have a critical stake in keeping the system intact. The result was a political crisis to which the “solution” – at the time being tested and tried in several other countries in the same predicament – was open authoritarian rule, with Marcos, whose personal ambitions and class interests coincided with those of the ruling families and their foreign patrons, acting in their behalf. Locating martial rule in the context of the country’s damaged and damaging political culture is indispensable to understanding why authoritarian rule happened – and what is even more crucial, why it can still happen. The media can and should continue to convey to their readers, viewers and listeners the necessity of never again allowing authoritarian rule. But of even more importance is the need for everyone to monitor the political system that has remained essentially the same despite the 42 years that have passed since Proclamation 1081, and in the process educate the present and future generations in the need to democratize it. Among the social institutions vital to mass realization of that imperative is the media.